I love Deviled Eggs and since Easter is right around the corner and a lot of you are about to have a whole bunch of hardboiled eggs on your hands, I thought now was the perfect time to share my mom’s awesome deviled eggs recipe. I lightened it slightly by using low fat mayonnaise, but otherwise this is just what she does and they are always a big hit! Even better still, each piece is just 42 calories or 0 Weight Watchers Freestyle SmartPoints. That’s right, ZERO SPs! The entire recipe (all 12 pieces) is 3 SmartPoints on WW Freestyle – it’s amazing! 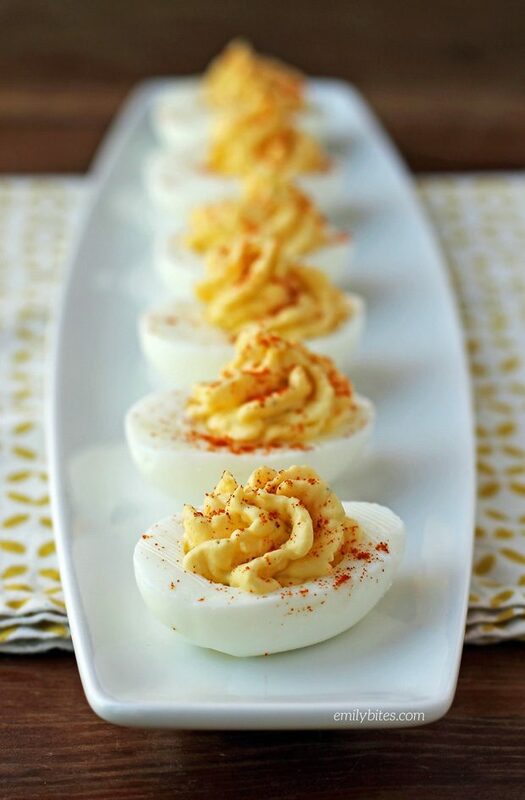 These deviled eggs are great to serve as a snack or appetizer, bring to a potluck or picnic, or even eat for breakfast. There are no rules here! For those of you who already love my Mom’s Easy Egg Salad, these have a very similar flavor, so you’re sure to love these as well. I usually buy Nance’s Sharp and Creamy Mustard at Wegmans, but I have heard from multiple readers who get it at Walmart! Looking for more tasty, lightened up egg recipes? Check out my Mom’s Easy Egg Salad, Turkey Sausage and Cheddar Omelet, Sausage, Apple Cheddar Frittata, Ham and Cheese Egg Cups, Butternut Squash Autumn Frittata, Hummus Deviled Eggs, Maple Bacon Breakfast Wraps, Corn and Zucchini Summer Frittata, Bubble Up Breakfast Casserole, Hummus and Feta Omelet, Ham and Cheese Hash Brown Quiche, Spicy Sausage Pancake Bake, Sausage Egg and Cheese Hash Brown Cups, Zucchini Squares and more in the Egg ingredient category in my recipe index! To hard boil the eggs, place the raw eggs at the bottom of a large pot. Pour water in the pot until the water is 1-2 inches over the top of the eggs. Place the pot on the stovetop uncovered and turn the burner to high heat. Bring the water in the pot to a boil. When the water comes to a full boil, cover the pot with a lid and turn off the heat to the burner. Leave the pot on the burner, covered, for 12-14 minutes. While the eggs sit in the covered pot, fill a mixing bowl ¾ way with ice water. When the time is up on the eggs, use a slotted spoon to remove them from the pot and transfer them to the bowl of ice water to stop them from cooking. Leave them in the bowl of ice water for a few minutes until fully cold. Peel the eggs under cold running water (I’ve found it’s much easier). Slice the eggs in half lengthwise and scoop the yolks out into a mixing bowl. Use a fork to mash the yolks as much as you can. I usually add a little splash of water to the mashed egg yolks and mash again. Add the mayo, vinegar, mustards, salt and pepper and stir together until well combined and mostly smooth. Spoon or pipe this filling back into the hollows of the egg whites. Sprinkle paprika over the tops of the eggs and serve. I calculated these to have 1 point for freestyle. It sounds like maybe you’re trying to calculate using the nutrition information. The best way to calculate the SmartPoints for a recipe is to use the recipe builder on the Weight Watchers website. The recipe builder recognizes zero point foods and does not assign them a value in the overall SP calculation, however these foods still contain calories, sugar, etc. If you plug the nutrition information for the recipe into the SP calculator it will count the nutrition information for these foods in the overall points per serving, often giving you a completely different result than the recipe builder. Also with 6 eggs that should be 12 servings not 6 as each egg is baked and each half is serving. If you eat two half deviled eggs that does come up as one point. delicious but I also calculate 1 WW smart point. I love the combination of flavors here. Seems like the finished product would be a little more interesting than the ones I’ve tried before.